Griffins' sculptural fluidity and compact design invites people of any age or background to come together through music and play. Patterned like the Swirl, the 11 note resonating metallophone delivers rich, reverberating musical tones that linger in the key of C major for 3-5 seconds. Griffin is engineered to produce notes that are never out of tune or 'wrong', any combinations of sound created on this durable outdoor instrument is simply enjoyable. 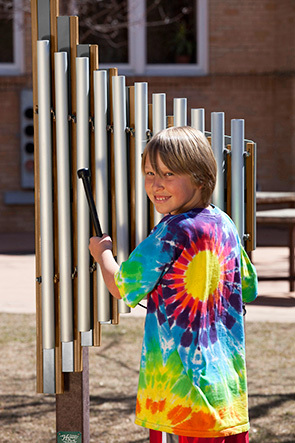 Modern styled and upright, the 26-1/4" long x 47-1/4" tall Griffin is constructed utilizing anodized aluminum chimes, resonators and an HDPE frame with attached rubberized tipped mallets. Available with a choice of recycled plastic or steel posts for in-ground or surface mount installations. Wall mount is available only with recycled plastic posts. 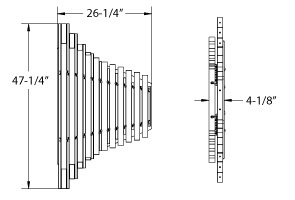 Ensembles instruments are specifically configured for in-ground, surface or wall mount installation, the recycled plastic and steel post mounts are factory cut for Adult or Toddler 'Finish Height'. The in-ground mount posts are ready for subgrade installations with 36" length for 'Frost Depth'. Actual Post Length = Finish Height + Frost Depth. Recycled plastic post can be easily cut to custom height in the field.